The Kriegshabers are giving up their home and wonder if a box of textbooks from their library would be useful. Enclosed are photographs "taken the day of the exercises for the new building". 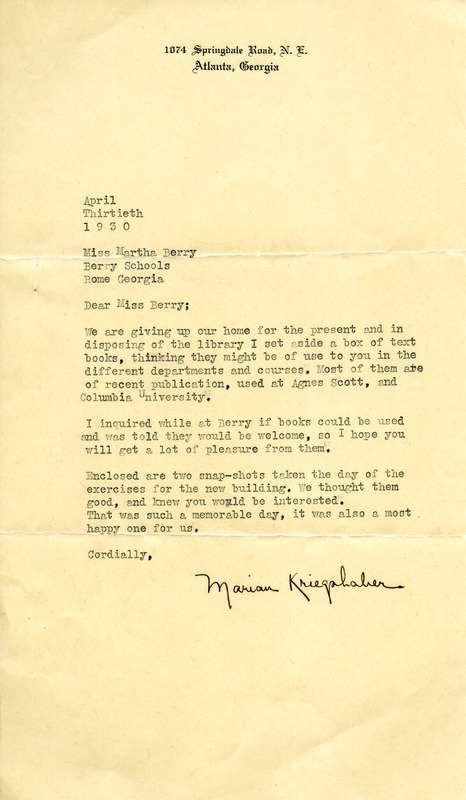 Marian Kriegshaber, “Letter to Martha Berry from Marian Kriegshaber.” Martha Berry Digital Archive. Eds. Schlitz, Stephanie A., Sherre Harrington, et al. Mount Berry: Berry College, 2013. accessed April 20, 2019, https://mbda.berry.edu/items/show/13115.